In 1909, the Florida Legislature declared the fragrant orange blossom the state flower. Centuries before, explorer Ponce de Leon named the state “La Florida,” meaning the “land of flowers.” Because of Florida’s sub-tropical climate, fragrant, heady flowers grow easily in the sunshine state. You’ll find Florida’s flowers being cultivated in orchards and gardens but also growing wild in open areas. 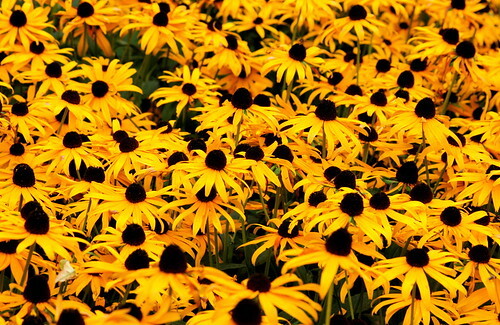 The black-eyed Susan is a member of the daisy family. With over 25 variations of this petaled flower, you can find lots of variety. The proper name for this daisy is Rubeckia hirta. The flower heads are heavy with 10 to 20 petals attached to a center called a “receptacle.” The receptacle may be purple or brown but can turn black. The variant “Indian Summer” may grow to 8 inches across. This Florida flower is a popular component to live floral arrangements. This flower grows plentifully in south Florida. The proper name for this red conical flower is Amaranthus spp. Amaranth is a fast-growing flower that requires little moisture and enjoys lots of hot, Florida sunshine. With a medium drought tolerance, amaranth is a popular folliage plant used in southern gardens. The leaves of the flower are dark green and oval shaped. The flowers are slightly puffy and made from hundreds of tiny flower buds. Ideal for Florida’s climate, the Sonja sunflower grows quickly and features very large blossoms. The scientific name of this flower is Helianthus annuus “Sonja.” The plant may grow up to 12 feet tall and produces blooms up to 1 foot in diameter. In Florida, the flower blooms pop up in spring but die quickly after producing a heavy seeded center. This flower likes full sun and has a moderate drought tolerance. Clean-scented lavender is the ideal flower for a container or flower garden. Florida growers often plant Provence Blue lavender because of its ability to withstand high temperatures and loads of sunshine. This perennial grows up to 2 feet high and blooms throughout spring and summer. The flowers grow in blue-silver spikes with dark green stems. This heady flower is perfect for making sachets or standing in a decorative vase of water.